Platform.sh helps a coder with the development workflow by making it easy to manage multiple environments, including the Master environment which runs the production website. It&apos;s precisely like a "development" or a "staging" server, except they are created on the fly, and they are absolutely identical copies of their parent environments. An environment is tied to a Git branch, plus all the services that are serving that branch. You can see that as a complete working website. 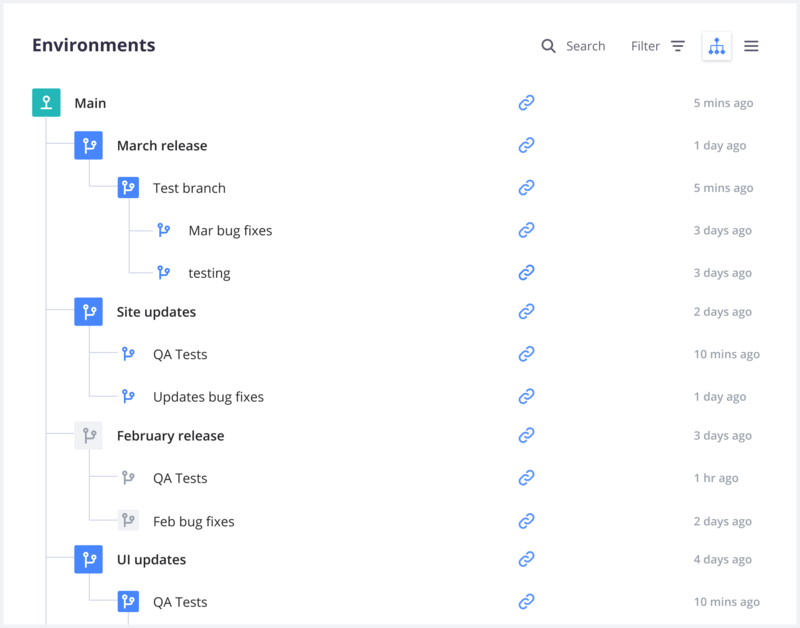 With Bitbucket and GitHub integrations you can even get a "development server" for each and every pull request. You can have branches that are not tied to a running instance of your application; these are what we call "inactive environments". Every Platform.sh project starts with a Master environment which corresponds to the Master branch in Git. If you subscribed to a production plan, this environment is your live site and can be mapped to a domain name and a custom SSL certificate. note Your project must have a master branch: it will not function properly without one. Platform.sh brings the concept of a hierarchy between your environments. Each new environment you create is considered a child of the parent environment from which it was branched. Each child environment can sync code and/or data down from its parent, and merge code up to its parent. These are used for development, staging, and testing. When you create a branch or child environment through the Platform.sh management console the branch it was made from will be treated as the parent. If you create a branch through your local Git checkout and push it to Platform.sh, or synchronize a branch from a 3rd party such as GitHub or Bitbucket, its parent will default to the master branch. Since you can organize your environments as you want, you have complete flexibility to create your own workflows. Agile: a child environment per sprint. Each story in the sprint can have its own environment as a child of the sprint environment. Developer-centric: one QA environment and a few development environments (per developer, per task...). Testing: an operational test environment, a user test environment and a few unit test environments. Hotfix: one environment for every bug, security, or hotfix that needs deployment. Here is an example of a possible Agile workflow. The administrator creates a Sprint environment and gives each of the developers permission to create new feature environments. Another approach is that the administrator could create an environment for each developer. As a feature is completed, the administrator can review the work by accessing the website of the feature environment. The new feature is then merged back into the Sprint environment. The remaining features will sync with the Sprint environment to ensure their working environment is up-to-date with the latest code. When the objectives of the sprint are complete, the administrator can then make a backup of the live site, then merge the Sprint environment into the live (Master) environment. The administrator can then synchronize the next sprint&apos;s environment with data from the live (Master) environment to repeat and continue the development process. Platform.sh provides great flexibility on the way you can organize and work with your development environments. To improve readability and productivity, it&apos;s important to think carefully about how to name and structure those environments. The name should represent the purpose of the environment. Is it a Staging site to show to your client? Is it an implementation of a new feature? Is it a hotfix?